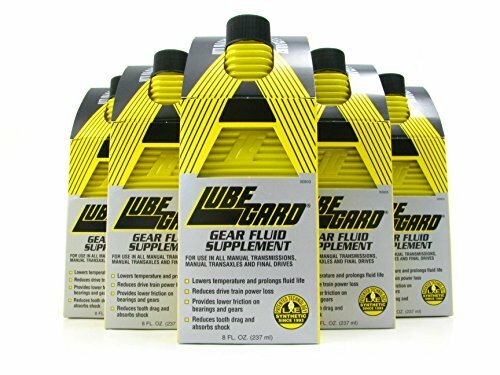 (6) 10 oz Bottle of Lubegard Standard Fluid Protectant Additive LUBEGARD® Gear Fluid Supplement is designed for use in all manual transmissions, manual transaxles and final drives that require gear oil. LUBEGARD® contains LXE (liquid wax esters) and their derivatives, a blend of high grade petroleum oil and synthetic base oils and a complete anti-wear formula. LUBEGARD® Gear Fluid Supplement is designed to provide high temperature stability to prevent coating of synchros and gears. Here are some of the benefits to using Lubegard Gear fluid supplement. Lowers temperature and extends fluid life; improves heat transfer from fluid to the case wall and out the gear box; improves gas mileage by reducing drivetrain power loss, improves all cold weather stiffness, improves all synchromesh transmission shift characteristics; reduces tooth drag and absorbs shock loads, thus improving the life of all gear units; lowers friction on bearings and gears with high wiping stresses, especially hypoid gears; minimizes oxidation and varnish deposits; suppresses lubricant foaming; safe for new MTF fluids.